We’re all human and thus susceptible to bitterness and resentment. We go through things, we get misunderstood and mistreated, and we deal with situations that we sometimes just cannot understand. The enemy will use any opportunity to get bitterness to take root in our hearts. We have to be on guard against this. We also have to be mindful that we don’t become the cause of bitterness in others. The root of bitterness can begin to grow when we are young, and it can be so subtle that we don’t realize what is happening/has happened to us. Let me give you 3 examples, starting with Regina. Regina resented the way she was raised. She didn’t know how to deal with the shame, pain and, no doubt, rejection that came with such a poverty stricken life. It didn’t help that her parents, professing Christians always had her siblings and her in church. It also did not help that they put God out front to take the blame for their responsibilities (a subject for another post). Her young life threw more at her than she knew how to process and deal with. Her childhood provided a prime condition for satan to work! I am sure you can imagine satan’s whispers to the young, disheartened and confused Regina. Can’t you just see him pointing out all the people who were better off than she was, better “quality” than her folks? Can’t you see him walking beside her through the years, just fertilizing the root of bitterness and resentment planted when she was just a little one? Can you see Regina living life without ever recognizing the enemy’s handiwork in her life? Regina’s life is a gazillion times better than it was growing up; she has money, a nice home, she wants for nothing (she thinks), and she even has a prominent position at the church. People seek her out for advice and she always has something “profound” to impart. Regina has “made it;” she’s finally like the Joneses, only better! Bitterness and resentment hide behind her “good life.” It hides behind her prosperous and wise reputation. Regina doesn’t recognize her heart’s condition; she is blinded by her success and the fact that her life surpasses the one of childhood. She thinks she’s fine because her life is “good” while the enemy of her soul stands on the sidelines and laughs, licking his lips because he got another one. Let’s look at Micah and Barbara. Like Regina, Micah and Barbara are wounded. The circumstances of their lives presented prime conditions for bitterness to take residence. Unless we’ve already gone through similar circumstances we cannot say 100% how we’d be affected. What blow will life hit us with that will slam us right at the proverbial fork in the road? Will the pain be so great that, like Micah, we don’t know what to do with it? Will it affect our lives so deeply that, like Barbara, we feel so justified in how we feel that we don’t recognize our bitterness/resentment? Maybe you grew up like Regina and vowed never to be brought to open shame because of poverty and ignorance again. Has the experience hidden a lifetime of bitterness/ resentment? I totally get it, I really do. I know from personal experience what it is like not to realize your heart houses resentment/bitterness. I am a stuffer. Since I was a child I have stuffed away disappointment, hurt, embarrassment, devastation and the like. I’d push it away and tell myself it didn’t matter, I was “OK” with whatever was said or done to me. The truth is I wasn’t okay, I just didn’t deal with it; I ignored myself. I too had hidden resentment and bitterness over the hurtful things I had to endure. I may not have gone as far as the three individuals above, but I closed up and tried my best to forget about myself. I soon felt more like a thing than a person. I didn’t realize I housed bitterness and resentment until God had someone reveal it to me! Have you reached that point? Maybe you’ve changed after a painful situation and, like Micah, don’t like who you’ve become. Maybe you’ve been nursing every hurt you’ve experienced at the hands of others and you don’t know how to stop. Maybe, like me, you would never have thought you had bitterness or resentment in your heart because you’ve told yourself nothing matters. There is hope today. You can get rid of the root of bitterness and resentment. 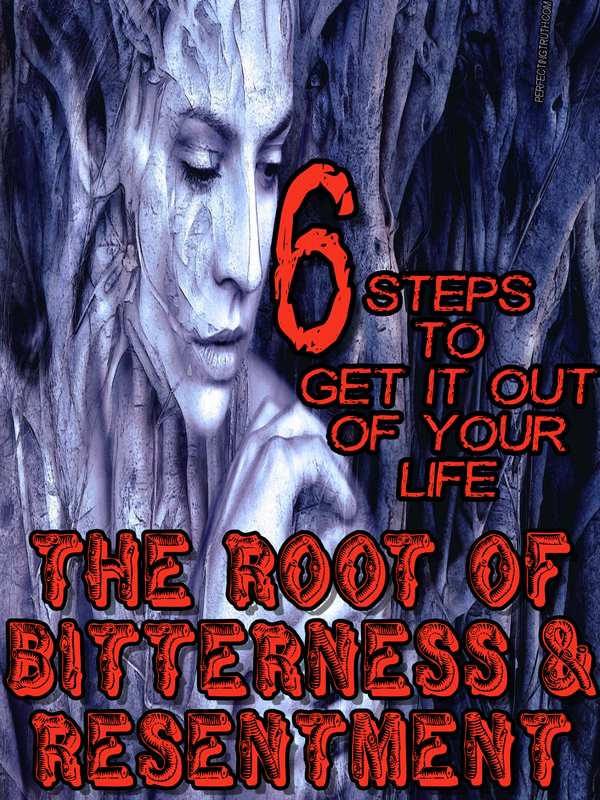 Keep reading as I reveal 6 steps to freedom. We know from Scripture that the opportunity for bitterness comes with the territory as human beings. The Bible teaches us to guard against bitterness (Hebrews 12:14-15). It also tells us that it is something we must get rid of (Ephesians 4:31-32). If God tells us to do something then it is possible for us to do it, and He equips us to do it right? Right! Tell God about it! Lay it all at the Lord’s feet; all of it! Admit it happened, accept that it happened, recognize it hurt and how you feel about it. Accept that it wasn’t right, and realize that you don’t have to like or feel good about the experience. Forgive person(s) who wronged you. Love those who have wronged you. I know what you may be thinking, but I promise I have not lost my mind. Our first thought is not to do good to those undeserving souls who’ve hurt us, but it is the only way. In order to keep bitterness out of out of our heart we must obey Scripture. We have to love those who have wronged us; we have to bless them, be kind to them. Remember, Christ is our example. Jesus, who was mistreated and abused worse that we can imagine, loved and forgave his enemies; He loved and forgave us! Do not keep rehashing the wrong over and over in your mind. Do not entertain thoughts of revenge or harm to the individual. Do not allow yourself to think unlovingly about those who wronged you. Have you ever been hurt to the point you became bitter? Were you able to overcome it? Thank you for the reminder to turn to God and fight resentment with PRAYER! Thanks for taking time to read and comment. I am happy you found the post helpful. Great message, with great insight. Bitterness, many times, is one of those emotions that isn’t identified and can be allowed to grow blindly. These are practical steps to help identify and prevent! Thanks for sharing! Thanks so much for reading and sharing your thoughts; I appreciate it. I am glad you found the post useful. Yes, I can relate to all of this. Noone would ever know I harbor bitterness. But it is eating part of me up inside. It is creating a barrier between me and God and me and a few family members. And it’s preventing some growth and joy in my life. I see other family members around me blooming and radiating while inside I feel the opposite because of some lingering resentment. Your 6 steps are important reminders for anyone. Thank you for sharing! Thanks for reading and sharing a little bit of your own story. Some things are not easy to get over; the hurt goes so much deeper than the surface. I encourage your to give it to God, all of it. Go somewhere you can pour your heart out to Him; scream if you have to! But pour every ounce of your heart on the matter into is hands. He can and will help you forgive and rid your life of the bitterness so you can live in the freedom and joy He has given you. Give God a chance. Okay? This is a great topic that I should attack on my own blog. I have had so many situations that has thrown me into bitterness and we talked a lot about forgiveness at my church this past Sunday. It’s the letting go part that’s so hard…. not bringing it up, just like the Lord has let go of our own sins towards Him. Thanks for reading and sharing your thoughts. I agree, it is not always easy to let things go, and that is where we have to ask God to help us. One reason for the difficulty, from what I’ve noticed, is the inability to stop rehashing it in our minds. I think we have to purposefully keep ourselves from thinking on the incident constantly. Once we have forgiven then we need to throw it in our own “sea of forgetfulness,” so to speak. I know an individual who says they have forgiven this person, but almost every time you have a conversation with them they have to bring up what they did, used to do, etc… They won’t allow themselves to let it go. I believe we have to be very careful about this. Yes. I’ve been bitter. Glory to God he didn’t leave me that way. God had to reveal the state of my heart to me in order for me to realize how hurt I was and how it was effecting my life. Once I was aware of the resentment I was filled with I prayed and repented. I ask God to help me to forgive that person and let go of my hurt. I gave my pain to God and through forgiveness I found peace and healing. Thanks for reading and sharing your thoughts. Thank God for deliverance right!? No one gets through this life unscathed, for it comes with its share of hurts. But thank God there is help and deliverance when we need it. Our God is such a wonderful, great, and MERCIFUL God. Bitterness sure does cause a whole host of spiritual and emotional ills. I think it can even cause some physical ones, too! Great post! Thanks for stopping by, reading and sharing your thoughts! I agree with you, and I know for a fact it can cause physical ills. I have seen its effects with my own eyes. It may not always be easy, but we definitely must rid our hearts of this and guard against it no matter the cost.